Posted on August 5, 2018 at 8:33 am. Hail storms make most homeowners nervous. Those icy chunks can leave behind significant damage to your home, particularly your roof. While rain, wind and snow can and damage your roof over time, the wear is more gradual and usually doesn’t require immediate action. But a hail-damaged roof is different. Depending on the hail’s size and severity, you may need storm remediation experts to come assess the daage. Imagine the damage of each hailstone as if someone has thrown a rock at your roof. A few rocks are no big deal, right? But what about a few hundred? Now consider size. Pea-sized hailstones aren’t much of a concern, even if there are quite a few of them. It’s a different story for hail that’s the size of a golf ball or even a tennis ball. The force at which pellets of frozen rain hits your roof, mostly controlled by wind speed, also matters. Lastly, consider the surface of the hailstones themselves. Some hailstones are smooth, while others are jagged like broken ice cubes. Those sharp corners pounding against your shingles can really hurt your roof. Different roofing materials react to hail differently. Asphalt roofs, whether shingles or flat, offer a tough exterior. This means they often sustain only cosmetic damage in the form of dark, round divots. A particularly bad hail storm, however, can expose the roofing felt beneath your shingles. This warrants a visit from home improvement roofing experts right away. 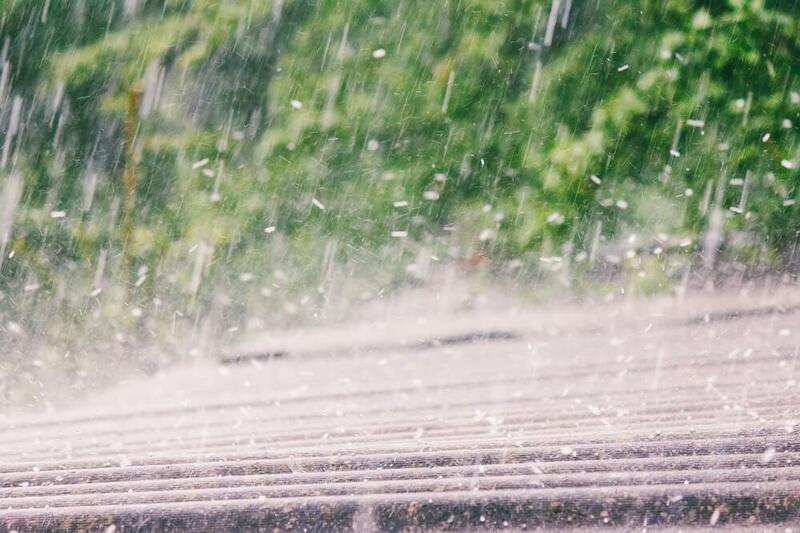 Wood shingles are significantly weaker than asphalt, leading to more pronounced divots or fractures, and jagged hailstones can even cause them to split. This opens up the risk for water damage and mold. A metal roof may seem more sturdy, but can sustain huge dents and even punctures depending on the hail’s size and shape. Once a hail storm has ended, what should you do next? Once it’s safe to do so, go outside and take a look at your roof. If you see a large amount of divots, dents, or punctures, you know you’ll need help from storm damage restoration experts. Also keep in mind the severity of the storm and size of the hail itself. Some dents may cause more damage than you might expect, because they can allow rainwater to slowly seep in. If you’re unsure, err on the side of caution and have the damage assessed by an expert. If your roof has suffered hail damage, we’re here to help. Interested in a free quote on residential roof repair? Just give us a call. Need financing help? We’ve got you covered.Rogers can even help you with the roof insurance claim process!